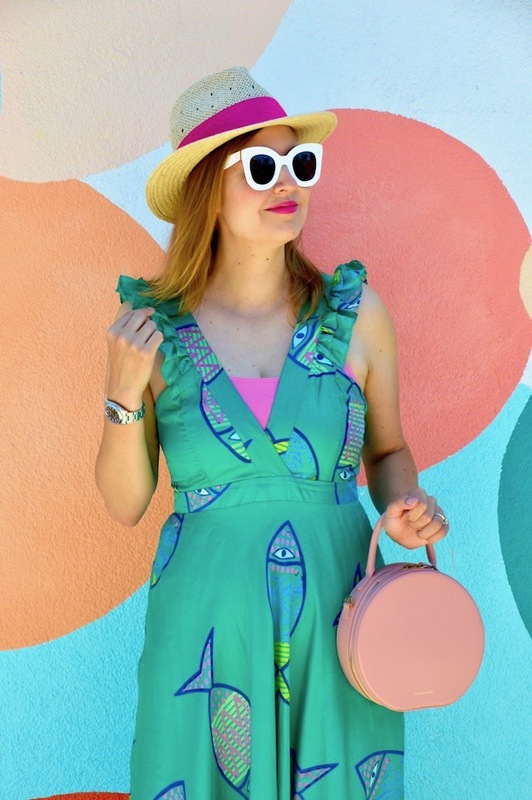 Since I love fish, I had my eye on this maxi dress from Anthropologie as soon as it came out at the beginning of summer, obviously because of the fun colorful fish print featured on the dress. The dress retailed for about $250, which I thought was a little steep, so I patiently waited for a sale. When it finally did go on sale a few weeks ago with an extra 25% off, I knew it was a good "catch"! Speaking of discounts, I recently obtained discounted tickets to the Aquarium of the Pacific in Long Beach. Since I love fish, it's only natural that I also love to go to aquariums and I knew that the aquarium would be the perfect place to wear my new fish dress! The only downside is that since it's 100% silk, I was a little afraid of getting water on it. Luckily, however, none of the sea life (or humans) splashed me! My husband and I also went out for a nice dinner after the aquarium on the Queen Mary, so it made sense to be a little more dressed up. Normally, however, I wouldn't be so formal for just a date at the aquarium because I don't think the fish really care what you wear! Last of all, how could I not mentioned this fabulous wall? Like the aquarium, it's also located in Long Beach. I saw it on the Instagram accounts of a few people and I just had to know where it was located because it's amazing! When I found out it was in Long Beach, I figured I'd make a point to visit and take photos the next time I was in the area. This wall is actually located on the side of a children's party store if you can believe it! Regardless, I think it's the perfect complement to my under the sea fish ensemble! That dress is definitely a "great catch". Super fun wall for photos too. Haha so fitting to wear this adorable dress to the aquarium! I love that! Perfect wall and place to visit with your dress! I love aquariums too and want to see the one in Atlanta at some point. I saw this dress on Anthro and loved it as well. It looks great on you, love the colors and of course the fish! So cute! 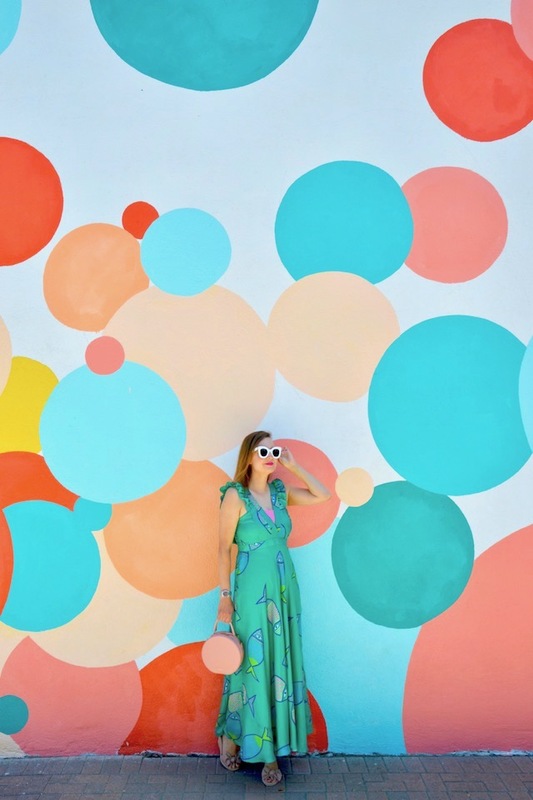 I love your dress and this painted wall is so fun!!! I’d love for you to join our link up tomorrow! 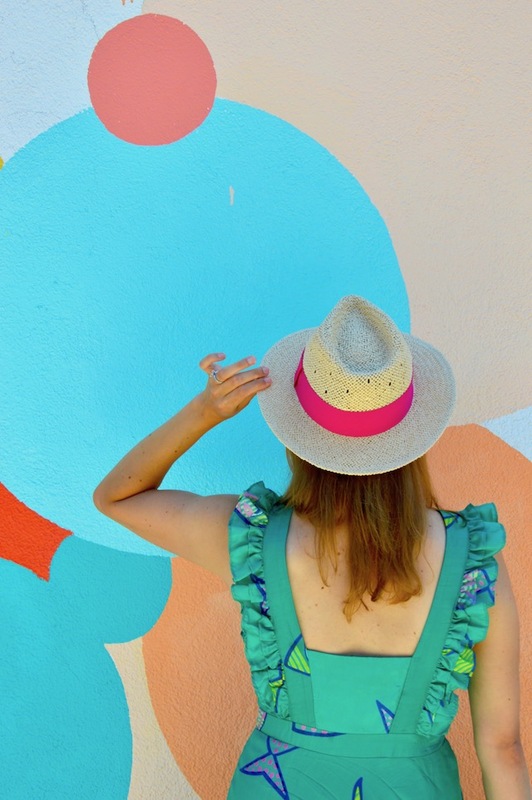 Your dress is so cute & I love the colorful location you found for photos!